Evren was hailed as a hero at the time of the coup for ending fighting that had left 5,000 people dead and put the country on the brink of a civil war. But he soon became one of the country's most controversial figures, remembered more for the torture of former militants and their supporters and for introducing a constitution that restricted freedoms and formalised the military?s role in politics. Turkish political leaders are still scrambling to replace the constitution he helped institute. In 2014 Evren, with the only other surviving member of the 1980 coup, was convicted of crimes against the state and sentenced to life imprisonment, the first generals to be tried and convicted of leading a coup in Turkey, which has a history of military takeovers. The court decision stripped him of his military title and demoted him to the rank of a private. The trial was made possible after the Islamic-rooted government of the then prime minister, Recep Tayyip Erdogan, secured constitutional amendments in a 2010 referendum, in the hope that the showcase trial would help put an end to the military?s interventions. Evren, the head of the Turkish military, sent tanks rolling through the streets of the capital at 4am on 12 September 1980, wresting power from a civilian government that was unable to keep order and dismantling checkpoints manned by battling militias. He shut down parliament, suspended the constitution, imprisoned civilian leaders and disbanded political parties. It was the country's third coup since 1960 and was welcomed by most Turks, who were no longer afraid to send their children to school and benefited from the rebound of an economy that had nearly ground to a halt. Yet 650,000 people were detained in the upheaval and 230,000 people were prosecuted in military courts, according to official figures. About 300 people died in prison, including 171 who died after being tortured. Evren always maintained that torture was not sanctioned by the military, although it was not clear what, if anything, he did to address it. 'It may have happened, but neither the [military-appointed] government nor the [military] council gave a directive for torture, torment or oppression,' he said in a documentary. Some 49 people were executed, including 17-year-old Erdal Eren, whose hanging for allegedly killing a soldier horrified Turks. Evren was unapologetic. 'So after I catch them and send them to trial, I will not execute them but look after them for the rest of their lives' I will feed this traitor who kills the soldier that gives his life for the land? Would you accept that?' Evren said in 1984. Turkey abolished the death penalty in 2000 as part of reforms to improve its chances of joining the European Union. Evren?s five-member military council ruled until November 1983 when the generals handed back power to civilians. Evren quit the military but remained in power after ensuring he was elected president for seven years in a 1982 referendum. The same referendum also approved a new constitution, which restricted labour unions and freedom of association, put universities ' which were scene of violence in the 1970s ' under strict state control, and muzzled freedom of expression. It gave the military political influence through the national security council, a forum of generals and top political leaders that still meets every two months to discuss internal and foreign affairs. A special clause ensured that no criminal charges could be brought against the coup leaders. Evren defended the constitution, saying it was designed to avoid mistakes that led to the civil strife of the 70s. Evren set parliamentary elections for 1983 but allowed only three parties with carefully vetted leaders to run. Former leaders such as Suleyman Demirel, who was ousted by the coup, and a former premier, Bulent Ecevit, whom he also blamed for the country?s ills, were barred from politics. On the eve of the elections in 1983 Evren all but told voters to cast their ballot in favour of a retired general who headed one of the three parties running. That backfired and Turgut Ozal, a liberal who Evren had put in charge of the economy, was elected prime minister after winning an overwhelming majority, and ushered in an era of economic liberalism. To Evren's dismay, another referendum, in 1987, lifted the ban on old politicians and Demirel and Ecevit returned to politics. In 2010, on the 30th anniversary of Evren's takeover, Turks voted in a referendum to a series of amendments to the constitution, lifting the coup leaders' immunity from prosecution. Human rights activists rushed to petition courts for Evren's prosecution the next day. The trial against Evren and a former air force commander, Tahsin Sahinkaya, the other surviving coup leader, opened in April 2012. Both men were too ill to attend but gave brief statements to the court through a video link from their hospital beds. Evren refused to answer prosecutors' questions, maintaining that the court had no right to put him on trial, but he made a brief statement saying the military was forced to intervene and introduce a 'new constitutional order to bring peace and calm?. Evren was born in Alasehir, western Turkey, the son of emigrants from the Balkans. He graduated from the country's war college in 1938 and later served in the Turkish contingent that fought in the Korean War. 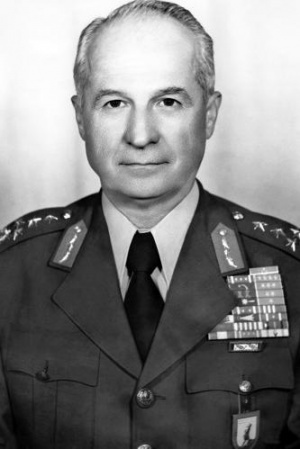 He was promoted to general in 1964 and was appointed chief of military staff in 1978.